Israeli politicians said the incident was "unacceptable"
An Israeli soldier has rejoined his unit after being left behind in Gaza during a raid against Palestinian militants, army officials have said. The soldier fell asleep during the operation last Thursday, but his absence was not noticed until his colleagues returned to Israel. 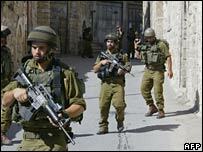 The unit re-entered Gaza several hours later and rescued the soldier, who had fired a flare and tracers into the air. The Israeli military said it had launched an inquiry into the incident. Israeli Deputy Defence Minister Matan Vilnai told Israel Radio that similar incidents had happened "dozens of times". "People are tired and not thinking straight after long hours or long days," the Associated Press news agency quoted him as saying. "Of course something like this is unacceptable, but it's understandable that it happens." The soldier feared he would share the fate of Gilad Shalit, a corporal held captive by Hamas militants for the past year, an Israeli newspaper reported. "I understood I was alone inside Gaza. I thought about Gilad Shalit and my mother sitting at home," he told his comrades, according to the Yediot Ahronot newspaper. The Israeli military said the incident had been caused by the commander of the Golani Brigade failing to count his men properly. The soldier was found 700m (2,300ft) inside the Gaza border fence.